I have been doing some cakes for friends and people I work with. So when one of them came to me and said his wife loved to go camping and if I would be able to make a birthday cake with a camper on it. So I said I would do my best. I started the cake 2 days before it was due. 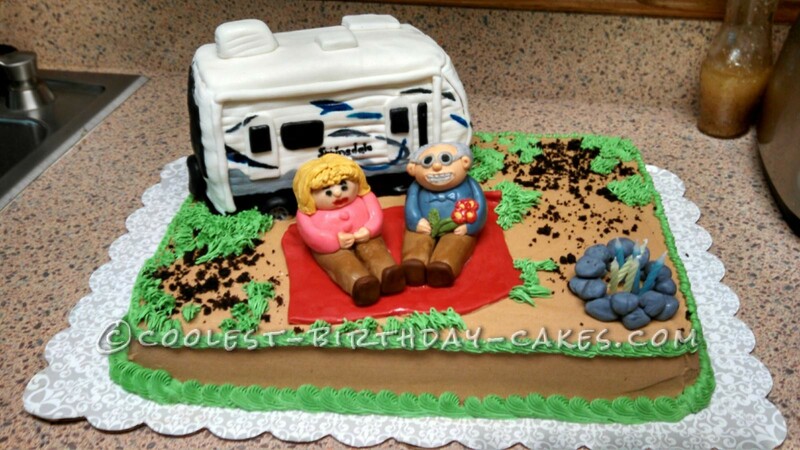 I made the camper out of cake and fondant, then made two people which would be the guy and his wife, sitting on a blanket. The guy has braces so I put braces on him. The cake was big enough so I could decorate with other camping things. Everything on the cake is eatable, even the camper. The party was at 1:00 and I had to work till 1:00 and I had a few more touches to finish. When I finished I brought it to his wife’s party. They loved the cake. I always get myself nerved up when making cakes but in the end they come out good. I like to take on new challenges and my friends will always have something new for me to try. I love creating new things. I have thought of going to school to learn more. The best part of doing this cake is making all the stuff to put on the top of this cake. The people was the easiest to do. The camper was the hardest, I know they are not perfect but I try my best in every cake I make, and everyone tells me I should do these cakes for a part time job. I like making the 3d cakes (thats what I call them) because they are so challenging. And as for this cake everyone and the part liked it and thought I has done a good job.